You are here: Home / Book Reviews / Trainable Cat or Trainable Human? Plus Book Giveaway! Trainable Cat or Trainable Human? Plus Book Giveaway! As you know, I have my human trained to give me treats when I show her certain paw signals, such as High Five, Shake Hands and such. But did you know that human training for cats is much more than mere parlor games and treats? What if your humans had to evacuate suddenly because of some disaster and they couldn’t get you in your carrier? And wouldn’t it be great if claw trimming wasn’t such a chore? How about just being able to live more easily with your family members, both two and four-legged? 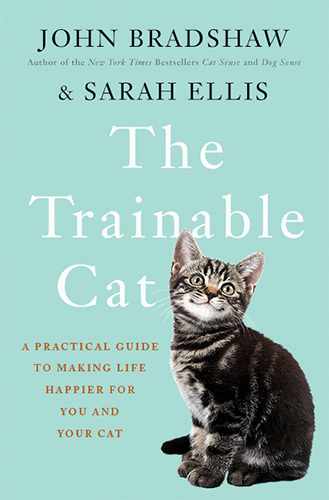 The Trainable Cat is all about you and your human developing awesome life skills. It gives your human the tools to look at you, the feline, in a clearer, more logical (to kitties) manner. It shows humans how to work with natural cat behavior to make regular tasks like trips to the vet, being groomed, and going on car trips so much easier for us cats. It’s the type of instruction manual that humans living with kitties have needed for a long time. The book’s two authors are as expert as humans can get without being cats. John Bradshaw’s name may be familiar — he wrote Cat Sense. He is also the foundation director of the Anthrozoology Institute at the University of Bristol. Sarah Ellis is a feline behavior specialist at International Cat Care. Together they have developed ways for humans to work with us cats based on our natural emotions and behavior — and when humans do that, miracles can happen! The thing I like best about The Trainable Cat is that you and your human work together as a team, kind of like the way my human and I work together. On top of gaining some great kitty life skills, your relationship with your human will grow closer and more intimate. You can’t get more rewarding than that! 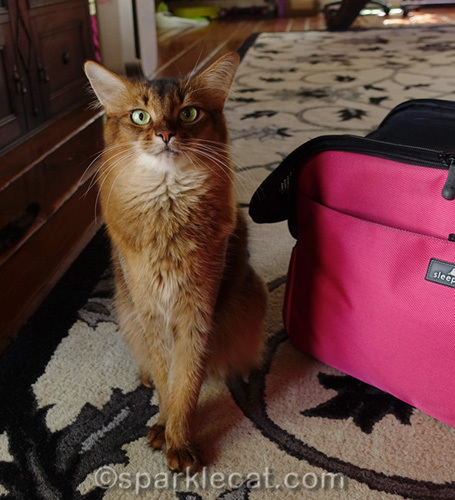 I was going to pose in this carrier to show that I’m not scared of it, and then Binga photo bombed me (what a surprise). But you know what? That proves that cat carriers don’t scare her either! Wouldn’t it be nice if you didn’t feel like running and hiding when one of these comes out? That can happen if your human reads and uses the information in The Trainable Cat — plus so much more! And want to hear something even cooler? I have a copy to give away to a U.S. reader! All you have to do is leave a comment on this blog post saying you want to enter, and I’ll randomly pick one name on October 10. Good luck! 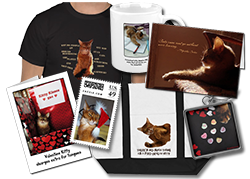 Links to The Trainable Cat and Cat Sense on Amazon are affiliate links, so if you make a purchase by clicking through, I will get a small commission. I received a galley copy of the book for review purposes. I want to enter to win the book for my human. Do I have to give the book back if I can’t be trained? We’d all love to give it a try. Thanks, Summer. We would like to enter the giveaway. It sounds like a great book, Summer! I’m adopting another cat so this book could help with her adjustment. Please enter me. This sounds like a very interesting book! Please enter me in the drawing. Thanks! Sparkle, Roxie Hart, Zazie, Bella Rose, Mitzi, and Zippy would love a copy of this book to give to me, their Mom. That sounds like a pretty good book. My three cats already have ME trained, so it would be nice if I could possibly turn the tables, lol. 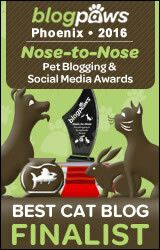 Oh boy would I love to win this, my cat needs to be trained badly! TW worries about fires and stuff all the time cos I hide UTB and she cant get me out. She’d evacuate without me but Pop wouldn’t. You can enter me cos maybe she’ll learn something. We have trained the human pretty well, but she could use some brush ups! Mommy leaves ours out and we often sleep in them, after all they are very comfy. We need this book, Summer, so we can train our human properly. Oh boy could we use that book here! Piper HATES the carrier and nail trims. It’s like wrestling a mountain lion (which would probably be easier) whenever we need to do either of those things. Pumpkin is afraid of the carrier but she’s much easier to handle (and there’s less blood loss on my part) but I would still love to help her overcome her fearful behavior. 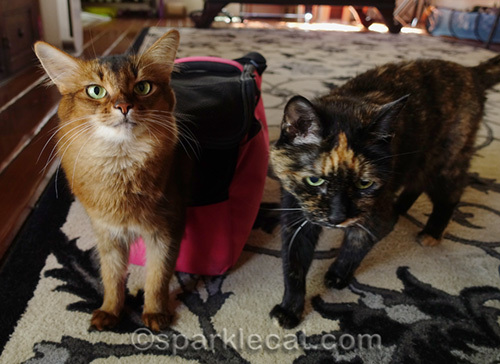 Hi Summer & Binga! It’s nice to see you both. Annie is so very scared of the carrier. Sadly, she urinates when she’s picked up to be put in it. Her fear breaks my heart. Thanks for the giveaway. I’d like to be entered. That sounds like a pawesome book! We didn’t realize that John Bradshaw was involved in anthrozoology at University of Bristol. Their Bristol Cats Study is one of the most amazing pieces of ongoing cat research in the world. Oh, we could really use this book. That looks like a pretty interesting read. Maybe after she has finished the 79 as yet unread books on her shelf, #1 can have a look at it. MOL! I see that #1 and my human have a plethora of unread books in common! This sounds like a great giveaway but we’re pretty sure Mom is too old to be trained so we’ll let someone with a more trainable Mom win it! We definitely want to enter this giveaway. This sounds like a great book. Nice to see Binga too. Mee-you Summer wee not sirprized that Binga foto bommed you…it iss what she does!!!! May mee enter LadyMum’ss name inn thee contest to win thee book? Hey, now this sounds like something our Mom could most definitely use… maybe to train herself a little better to get into that carrier. What? Not for training Moms into carriers? Hmm, well, you learn something new every day. Then again, you never know! I just want to train you to rub up against me, sit on my lap, knead my neck, and to purr loudly! Our human is trained, but she can always get better. We think she should read the book. Looks like a book our human should read. She has trained several of us to do tricks, but Iggy is really mental and she could use some advice on how to break through to him. Hi Summer and Binga! Please enter me to win this great book! TY sweeties! Mommy is VERY trainable. Me….not so much. Binga I adore you and so does mommy. That is really a must read book. Thank you ladies for telling us. I would love to have the book. Your Binga looks so much like my Kim. Torties are so much fun! Frannie hates it when her carrier comes out I’d love to learn ways to help – we could use a copy of this book! Please enter us! We’ve got our peeps very well trained! Summer, you should write a book about everything you can do. We loved the book as a galley softcover months ago but didn’t finish reading until our hardcover review copy arrived. Not only is the book easy to follow, the research process is covered in a number of BBC videos. It’s some of the most appealing and insightful video content I’ve seen about cats. Don’t enter us in the contest since I’ll be doing one of our own. This is just my kind of book. I love training horses–I could use some ideas on how to train cats. That looks like a fantastic book sweet Summer! I am going to have the day buy a copy so you can leave us out of the drawing. We don’t think our Mum is ever going to be trainable. Our mommy is hard to train…. While we do not like our carriers, we do get in them when we have to.